Sciblogs | Homeopathy – practical remedies to address it? MacDoctor last night wrote a post on the ethics of homeopathy: check it out. As it’s a lazy sort of weekend a few off-the-cuff thoughts on a different aspect of the subject might fill the bill. I’d like to offer suggestions as to what might be practical remedies to educate and curb use of homeopathy for weekend rumination. Readers are welcome to pitch in with their own suggestions. Insist that the ingredients in the final product, and their amounts, be listed on the bottle. Take a look at the bottles of homeopathic remedies in your neighbourhood pharmacy. They don’t list what’s in the final product. What homeopathic remedies list are the ingredients that are placed in the starting mixture, not what it’s in the resulting product. The diluted ingredients are not in the final remedy – they get eliminated in the repeated dilutions. One rule for all remedies: all remedies must list what’s in the product. That homeopathic remedies can get away with not doing this is silly. International standard measures should be used. It’s obvious, right? Use measures that can be compared directly with other remedies on offer and are generally understood, like those defined by IUPAC. That these producers can get away with not doing this is also silly. Have products that lack sound evidence be marked ‘Untested remedy’. OK, this one will raise a few hackles and obviously a little less serious. But really, why not? It’s the nub of the thing after all; all this suggestion is asking is that it be made explicit and stated directly. When people talk about ‘complementary’ remedies or ‘alternative’ remedies, the key point isn’t that they are ‘complementary’ or ‘alternative’. The key point is if they can be demonstrated to work. (Think: what are they complementary or alternative to, and why?) Sellers of homeopathic remedies not supposed to be able to make therapeutic claims but it’s very obviously worked around, for example, with names that imply a therapeutic use. It’s possible that’s all that some customers read – the name of the remedy. Mark products with a level of evidenced support. This is a little more complex variant on the same basic idea as in the previous suggestion. It harks back to on-line efforts (e.g. this one) that try to broadly indicate the level of support for particular ingredients for particular treatments. Perhaps a simple scale–1 – 5 stars, say; homeopathic remedies would get no stars–and an identifier or a short URL that can be used to look up a more detailed account on-line (think mobile phones with network access, etc.) To do this well is fairly tricky, but the idea is to convey the broad essence of the thing simply and concisely. The vast majority of herbal medicines are unlicensed, in fact, a grand total of zero, yes zero Chinese medicine products are licensed and only one has been registered so far under the Traditional Herbal Registration scheme. I hope that studies monitoring the use and understanding of these remedies by the general public are taking place in parallel to these legislature changes. It would be interesting and useful to examine what effect they have quantitatively. 1. See also the comments on his original forum. 2. There are exceptions where, for example, silver oxide is listed but not said to be an active ingredient, leaving a (false) implication that their high dilution of exotic herbs (or whatever) is the active ingredient and this is ‘other stuff’. 3. Often well before the dilution series is complete, in fact. 4. Don’t get some idea that I’m dissing everything; natural products have long been a source of sound remedies and there are good reasons for that. The thing is that you need to show that have some useful effect in a reliable manner, rather than spin a ‘hopeful story’ that they might. 5. My reading of the relevant regulations are that homeopathic remedies are forbidden from making claims for a therapeutic purpose. 6. The directive in all it’s glory (read: administrative language) can be found on the European Law website. State the final concentration of alleged contents as a percentage (okay, all those zeroes might not fit on the label!). Indicate that the alleged concentration of contents has not been analysed, and is below the limit of detection of any analytical method. Some great points here, will have to mull these over further. I think one of the most effective practical steps would be, as tried to the UK, to get the major pharmacy chains to stop stocking homeopathic products completely, and also for them to have an education programme for employees to concisely inform customers why they’re not stocked. I’m guessing pharmacies are one of the key sources of exposure a consumer would have to homeopathic products. Also, they have a very legitimate face, so homeopathy becomes legitimised by association, which is obviously something that needs to change. Without pharmacies, people would have to actively seek out CAM stockists and services, and I’m guessing a much smaller proportion of consumers will do this. Some good ideas, Grant. There are already a number of systems for quantifying the level of evidence in medicine (apologies for using Wikipedia, but this article is actually quite a nice summary). The UK NHS system is the one I am most familiar with. The key word for level A and B evidence is the word “consistent”. It is not good enough to cite a single favourable trial in order to say if something really works (although large, properly-constructed, double-blind RCTs come close). Evidence for homeopathy is, of course, almost all level C and D. The sparse level B evidence for homeopathy is not even vaguely consistent. There’s some good ideas here. Why not introduce a set of uniform standards. And I believe Homeopathy does have a powerful curative effect, for unknown reasons which is far above placebo effect. 1. Homeopathy is a completely different system of medicine, uses high dilutions with no molecules and therefore cannot have, at least for the high dilutions, conventional biochemical actions and mechanisms. Therefore the “gold” standard of double blinded placebo controlled randomized testing will NOT work for Homeopathy. Amazingly, homeopathy has succeeded in showing some positive results in these kinds of tests. A better and completely individualized method of testing, tracking far more data on the subjects than is usual, would be needed. 2. If the documented evidentiary standards are to be applied to Homeopathy, they MUST be applied to all the other drugs in the pharmacy too. But then some huge per cent of these over the counter medications, not to mention the prescription ones, will be found to have performance, satisfaction and efficacy levels below even the homeopathics in some cases, or at best below 50%. Look at Prozac, recently found, after passing all of its initial testing and clinical tests, to be essentially ineffective. Let’s have the same standards for everything, yes, but NOT the same method of testing. Misleading everyone by applying tests made for pharmaceutical synthetics to Homeopathic high dilutions is misleading if not outright deception. You get one guess who might benefit if it is the latter. And I believe Homeopathy does have a powerful curative effect, for unknown reasons which is far above placebo effect. That’s blind faith and not evidence. Homeopathy is a completely different system of medicine, uses high dilutions with no molecules and therefore cannot have, at least for the high dilutions, conventional biochemical actions and mechanisms. The laws of Chemistry/Physics are universal. Molecules must/should act in the same way (given that other physical conditions are held the same), whether they’re biochemical actions inside a dog, bacteria, human-body, cockroach, etc, and itâ€™s irrelevant whether the molecules do come from homeopathic treatments or conventional medicines. Remember, that it is Universal and that’s the first thing that you should be mindful of. There is no such thing as a different Homeopathic laws of thermodynamics (alternative medicine) and another called main stream (conventional) science laws of thermodynamics. Laws of thermodynamics is one, whether one lives in the Pacific Islands or in Auckland or whether one is being treated at Auckland Hospital or at a Homeopathy clinic, the laws of thermodynamics would still equally apply to the molecules of the medicine being administered to the patient. Amazingly, homeopathy has succeeded in showing some positive results in these kinds of tests. Amazingly, I’m so amazed at suckers like you, despite the explosion of knowledge in modern science, you still believe & cling tightly to myths from 200 years ago as homeopathy. Letâ€™s have the same standards for everything, yes, but NOT the same method of testing. I’m going to state this once & for all, then after that you must come up with something new in your next post and not to repeat again the rubbish you have stated in your previous message above. Our bodies are made up of atoms. The atoms behave in a universal way, irrelevant whether those atoms are being exposed to homeopathic or conventional treatments. The same method of testing must be used for both, since atoms don’t obey a different physics when it comes to homeopathy and then obey different physics when it comes to conventional medicine. Atoms obey the same laws regardless, so it means that the method use for testing MUST be the same. Anyway, the physical basis for the claim that water holds long term memory has been debunked. See the following paper. Homeopathy is a completely different system of medicine, uses high dilutions with no molecules and therefore cannot have, at least for the high dilutions, conventional biochemical actions and mechanisms. Therefore the â€œgoldâ€ standard of double blinded placebo controlled randomized testing will NOT work for Homeopathy. Even if we are to humour the pseudoscience in the first sentence, that would not render double-blinded placebo-controlled randomized testing obsolete for investigating the results of homeopathic treatments. Nor would more deeply individualised testing be necessary. A carefully conducted trial would still show whether or not homeopathy is *effective* in terms of what condition it was applied to. About the percentages, itâ€™s thought. Some use mg/g, etc. Strictly speaking the correct representation in the case of homeopathic remedies would be the probability that the container contained a molecule of the active substance in the original mixture, rather than an amount, as the vast majority of containers the customers bought would contain not a single molecule of the original active substances. Thanks for the link. Are these evidence levels indicated on the products in the UK, USA, etc.? Is there something that directly indicates on the products where the consumers can obtain information about how the products stack up? Just to be clear: Iâ€™m aware there are systems to quantify levels of evidence for medicines; what I was suggesting is not these systems in themselves, but something present on the labels on products on the shelves that consumers can work with on their own. Iâ€™ve mentioned this before (here for example). ->Thatâ€™s blind faith and not evidence. No that’s 200 years worth of powerful evidence – case studies, reports from Doctors and patients. YES, it is IS anecdotal, but in a situation such as Homeopathy, where research is ongoing, it DOES have significance and CANNOT be discounted. Not proof, that’s right, but NOT without significance either. ->The laws of Chemistry/Physics are universal. Molecules must/should act in the same way (given that other physical conditions are held the same), whether theyâ€™re biochemical actions inside a dog, bacteria, human-body, cockroach, etc, and itâ€™s irrelevant whether the molecules do come from homeopathic treatments or conventional medicines. Remember, that it is Universal and thatâ€™s the first thing that you should be mindful of. Agree fully! Only we don’t yet KNOW all the “Universal” laws and the ones we currently know do NOT discount the possibility of Homeopathy at the atomic level. I quote Nobel prize winning physicist, Dr. Brian Josephson from his home page comments on “Is Homeopathy Nonsense? and Why it May Not Be”. ->Amazingly, Iâ€™m so amazed at suckers like you, despite the explosion of knowledge in modern science, you still believe & cling tightly to myths from 200 years ago as homeopathy. I’m no sucker and probably even more skeptical than you. I’m well aware of the speculative nature of Homeopathy and my initial reaction to it was that it was complete and utter nonsense. But misrepresentations about the experiment of M. Ennis (Inflammation Research, Vol 53, p181) in which biological effects were being caused by a high dilution with no molecules remaining of the stimulant, that is, misrepresentations in a BBC Horizon documentary in which they explicitly claimed to have “repeated” her experiment BUT ACTUALLY DIDN’T, convinced me to take another look. ->Iâ€™m going to state this once & for all, then after that you must come up with something new in your next post and not to repeat again the rubbish you have stated in your previous message above. ->Our bodies are made up of atoms. The atoms behave in a universal way, irrelevant whether those atoms are being exposed to homeopathic or conventional treatments. The same method of testing must be used for both, since atoms donâ€™t obey a different physics when it comes to homeopathy and then obey different physics when it comes to conventional medicine. Yes the atoms behave in a universal way, quite correct! But that we must use the same method of testing, now there we disagree. In case you didn’t know, the testing is NOT at the atomic level, it is at the level of Doctor, patient and illness. Get it? This is a macroscopic domain. ->Anyway, the physical basis for the claim that water holds long term memory has been debunked. See the following paper. I read only the abstract but it looks interesting. Unfortunately you can find similar papers, in particular from famed materials physicist and researcher Dr. Rustum Roy (recently deceased) which assert other theories. The water “memory” idea is by no means “debunked” and a current Nobel prize winner, Dr. Luc Montagnier and his research group is being funded by the Chinese to continue research in this area.Why? Because there exists experimental anomalies like the one confirmed by Dr. Ennis that indicates something is going on there. Same with Homeopathy. There is some sort of major curative effect and it cannot be mere placebo. In this article, you will find explicit comments on the narrowness of the one “true” testing viewpoint, explicit comments on homeopathy testing, even double blinded randomized placebo controlled testing in which homeopathy clearly succeeded and other comments on the political and philosophical dangers inherent in the scientism fallacy. So you see, the opposing opinions are not “rubbish” and EXCUSE ME, very much open to research, and debate. MS -> Even if we are to humour the pseudoscience in the first sentence, that would not render double-blinded placebo-controlled randomized testing obsolete for investigating the results of homeopathic treatments. There is no pseudoscience in the sentence and the over reliance on the double blinded randomized placebo controlled method of testing, a method which does not even work very well for the pharmaceutical synthetics for which it was intended, is at the root of the fallacy of dogmatic scientism (see Milgrom’s article at the link below for what that is). Anecdotes are not evidence (in the scientific sense). They can suggest things that might be worth going on to investigate, but they are unable to provide conclusions. the ones we currently know do NOT discount the possibility of Homeopathy at the atomic level. Excuse my correcting you, but actually they do. Homeopathy isnâ€™t speculative; itâ€™s straight-forward nonsense. Itâ€™s not a case of something that is known to work, that people are trying to resolve the mechanism of how it works. It is something that has repeatedly been shown not to do better than placebos. Given this, there is no need to try look for a mechanism or otherwise try to justify homeopathy: itâ€™s already been shown that it doesnâ€™t â€œworkâ€. Youâ€™d be wise to locate the original sources of the people you quote rather than continually work through the â€˜filterâ€™ of the Alliance for Natural Health – best to read people speaking for themselves in their original context, rather than a context with a bias. GJ -> Anecdotes are not evidence (in the scientific sense). They can suggest things that might be worth going on to investigate, but they are unable to provide conclusions. I quite agree! They are NOT evidence and are unable to provide conclusions…BUT they are sufficient to form an opinion on the POSSIBILITY that something is going on and should be investigated. In addition, in a situation where the research evidence is still being sought, is equivocal or insufficient, the other forms of evidence including anecdotal attain GREATER significance than usual, in my opinion. Add to that the nature of the 200 year evidence, that much is from well trained and credentialed MD’s, research scientists and others. …the ones we currently know do NOT discount the possibility of Homeopathy at the atomic level. GJ->Excuse my correcting you, but actually they do. I’m not sure that water DOES have a memory and therefore do NOT restrict myself to reducing the entire unknown status of a possible homeopathic mechanism, if any, to any single thing. GJ->Homeopathy isnâ€™t speculative; itâ€™s straight-forward nonsense. No! It just SEEMS nonsensical – quite a different thing, and hardly something on which to base a scientific opinion. GJ->Itâ€™s not a case of something that is known to work, that people are trying to resolve the mechanism of how it works. It is something that has repeatedly been shown not to do better than placebos. Excuse me but I categorically deny this assertion on 2 major counts. As you know, the journal Nature itself published meta analyses over the years some of which purported to show Homeopathic efficacy above placebo. I’m not too thrilled by the quality of those studies (I’m certain you’re not too). Then, in 2005, Nature published the Shang meta analysis, widely advertised to be based on hundreds of studies (it was) but which then by means of questionable exclusionary criteria, based its conclusion that Homeopathy efficacy was no better than placebo on a grand total of eight studies (8 !!). I say that neither side can make any definitive conclusions based on this sort of stuff. Secondly, as I stated, it is my opinion, backed up by Milgrom’s comments, that the status of the double blinded placebo controlled randomized testing method is way overblown and should in no way be given primary status as a determinative factor – not to mention that it is a totally inappropriate testing method for homeopathy. Therefore NEITHER side can claim anything more than opinions at this stage. Period. GJ->Given this, there is no need to try look for a mechanism or otherwise try to justify homeopathy: itâ€™s already been shown that it doesnâ€™t â€œworkâ€. Most strongly disagree. It not only has NOT been shown to NOT work, it is working for thousands of people, and being used by MD’s and other qualified health professionals across the world on a fairly regular basis. I could care less however “mysterious” it seems to be. It works. Do you mean to tell me that ALL these experts, and their patients, are being fooled in the greatest case of mass self delusion in the history of science?? That would be as crazy as some of the theories of homeopathy !! GJ->Youâ€™d be wise to locate the original sources of the people you quote rather than continually work through the â€˜filterâ€™ of the Alliance for Natural Health â€“ best to read people speaking for themselves in their original context, rather than a context with a bias. Milgrom’s article is complete, as far as I know, and appears in other places as well. I really don’t know too much about the Alliance for Natural Health, I’m not a member and the only reason I keep giving that link is because that’s the first hit I get in google when I search for Milgrom’s article. Except for Sceptics Bane, most all of these posts are pharmaceutical propaganda — DOCTORS are not gods. Due to the fact that homeopathy has been around BEFORE the synthetic versions – there is no funding for studies. Gee, I wonder who gets to run the show if there is no homeopathy allowed, or if it is regulated the same way drugs are. Efforts to squash competition to the drug companies is all this hulaballoo is about. They already have too much power. I have worked for these horrible companies, and you cannot tell me that all synthetic drugs work. Vaccines are NOT proven, many cause HARM, and many drugs are ineffective as well, which puts blind faith into the same boat you are lumping homeopathy with. What works for one may not work for someone else, so realistically – doctors should leave those who want to utilize homeopathy alone. Why is everyone so intent to tell everyone else what to do? Live & let be. Pharmaceutical companies test and publish favorable results ONLY. They hide unfavorable results to get the drugs passed quickly. Consumers need CHOICE, and the ability to make informed decisions THEMSELVES. A Havelock North 18-year-oldâ€™s car smashed into a power pole on December 27. She was in critical condition when she was transferred to Auckland City Hospital late last year. She was on life support for 15 days. Doctors then gave her a bad prognosis, saying the teenager had no hope of recovery and felt there was nothing more they could do for her and withdrew life support against her family’s wishes. Her parents, who practise acupuncture in Hawkeâ€™s Bay, contacted experts to give her herbal and acupuncture treatments. Her programme of physiotherapy and speech therapy were enhanced with Chinese herbs and homeopathy. She eventually pulled through and after spending a few weeks recovering in Hawke’s Bay Hospital and was able to return home. Quite remarkable for a person who was â€œsentenced to deathâ€ by a group of doctors! It turns out that @doctorarnabpal is actually a homeopath but to look at his latest edition 7 of the 14 articles are pro-evidence based medicine of a skeptical or humorous nature. Of the pro-homeopathy articles many are from content factories and one, the main one, is complaining about poor “balance” on a CBC segment. I don’t think I need to explain the “balance” they’re talking about to this audience. The suggestion that the ingredients in the final product be listed on the bottle, would seem to be a sensible one. But hang on a minute, this often isn’t done for even conventional prescribed medications, is it? I’ve seen pharmacy labels with drug names like losec or augmentin, which are only brand names, not the correct chemical names of their active ingredients. There can even be different names for the same thing, like augmentin and synermox. So listing is fine, as long as it’s universal. FF->->Amazingly, Iâ€™m so amazed at suckers like you, despite the explosion of knowledge in modern science, you still believe & cling tightly to myths from 200 years ago as homeopathy. SB->Iâ€™m no sucker and probably even more skeptical than you. SB->But misrepresentations about the experiment of M. Ennis (Inflammation Research, Vol 53, p181) in which biological effects were being caused by a high dilution with no molecules remaining of the stimulant, that is, misrepresentations in a BBC Horizon documentary in which they explicitly claimed to have â€œrepeatedâ€ her experiment BUT ACTUALLY DIDNâ€™T, convinced me to take another look. There’s a lot of links out there pointing to the fact that it did actually take place. The M. Ennis study has been replicated many times with more failing to reproduce the outcome than confirming it. FF->Our bodies are made up of atoms. The atoms behave in a universal way, irrelevant whether those atoms are being exposed to homeopathic or conventional treatments. The same method of testing must be used for both, since atoms donâ€™t obey a different physics when it comes to homeopathy and then obey different physics when it comes to conventional medicine. SB->Yes the atoms behave in a universal way, quite correct! But that we must use the same method of testing, now there we disagree. In case you didnâ€™t know, the testing is NOT at the atomic level, it is at the level of Doctor, patient and illness. Get it? This is a macroscopic domain. 1. Why do you think anything should be exempted from the process? 2. What is at fault with the methodology? And no, “It doesn’t work for X” is not a fault so come up with something else. 2. What better methodology would you replace it with? SB->Unfortunately you can find similar papers, in particular from famed materials physicist and researcher Dr. Rustum Roy (recently deceased) which assert other theories. SB->So you see, the opposing opinions are not â€œrubbishâ€ and EXCUSE ME, very much open to research, and debate. It’s been researched and found wanting. It’s die hards like you that refuse to accept solid evidence or who have no clue about test, trials and statistics that keep things going. Do you realise that your second statement is in direct contradiction to your prior statement? What evidence would it take to have you change your mind on the efficacy of Homeopathy? Regarding Holozitz Reginald, can we agree to not bother responding to the irrational conspiracy theorist? Charlie Kum, the human body is capable of doing some amazing things. This is nothing more than an anecdote (which you provide no reference for) and says much more about the durability of the physical form than the efficacy of the treatments (conventional and alt) that she received. Although I’d give credit to the doctors that managed to keep the body functioning long enough for it to be able to recover despite their prognosis. Grant, I hope you don’t mind me pimping this. If so, feel free to delete this comment. I run this gathering called New Zealand Skeptics in the Pub (linked via my name above) and we have meetups in 5 centers nation-wide now. I’ve recently added a new gathering to the Wellington SitP called “Planning Activism. The gathering is on May 2nd and will occur at The Thistle Inn near the railway station in central Wellington. The idea behind this is to find out what sort of woo people are interested in and to work out what options we have available to us for combating it. It’s the first of what I hope to be a regular focus group based meetup. If you’re in the Wellington area you’ll be most welcome to come along. 3)that they suggest that it cannot be proven to work using standard techniques used to assess genuine medical treatments. This essentially comes down to a “you just have to believe it works” approach. Homeopathy has been around for over 200 years during which time homeopathy. In all that time homeopaths have not managed to provide evidence that it works or a mechanism for it. Furthermore, if it did work then modern medicine would not have developed as it has. Rather we would all be taking homeopathic medications. For all the talk of conspiracies, when something works it will eventually come to the for and be taken up by society. Homeopathy has had 200 years to do so and has failed, because it is not a therapy that works. I started this reply some time ago, then decided I had better things to do on a nice autumn day. Since then, Gold has added her reply, which you might prefer to address over mine (below). Youâ€™ve contradicted yourself, notice; you previously wrote that they were evidence. As I pointed out it already has, with the results showing that homeopathy is has no effect beyond placebo effects. Erm, youâ€™re already said this isnâ€™t evidence, etc. Iâ€™m not sure that water DOES have a memory and therefore do NOT restrict myself to reducing the entire unknown status of a possible homeopathic mechanism, if any, to any single thing. Straw-man argument; I didnâ€™t make this sort of claim. No, it is nonsense: homeopaths explanations need either infinite dilution, which is impossible as atoms are finite, or requires water to have a â€œmemoryâ€. Neither are meaningful. It is telling that the mythology behind homeopathy started with the former and dropped it, looking for something else to shore up their product. In any event these explanations are moot as homeopathy has been shown not to have an effect beyond placebo effects. As you know, the journal Nature itself published meta analyses over the years some of which purported to show Homeopathic efficacy above placebo. I’d add here merely being published in a scientific journal does not make something â€œrightâ€. It just be means an argument for a case has been published. It not only has NOT been shown to NOT work, it is working for thousands of people, and being used by MDâ€™s and other qualified health professionals across the world on a fairly regular basis. 1. Hearsay wonâ€™t make it right, but evidence might. As I pointed out, it has been tested and shown not to have effect beyond placebo. 2. Popularity does not mean effectiveness or sensibility. The only way for you to know this is to know the original source 😉 In which case you could cite it. It would be good if you would. Sorry there are so many pseud’s and I was madly dashing it off before heading out the door. Suggestion: perhaps you could help others by adding an â€˜aboutâ€™ section to your blog so that people have a means to learn this. If one is present, I canâ€™t see it. Point. It’s not really _my_ blog. There’s a few of us using it. But yeah, I should check and see if profiles are at least turned on. The suggestion that the ingredients in the final product be listed on the bottle, would seem to be a sensible one. But hang on a minute, this often isnâ€™t done for even conventional prescribed medications, is it? [â€¦] So listing is fine, as long as itâ€™s universal. I agree that to be fair youâ€™d have to apply whatever you come up with across the board. I think there is a bit of an issue with homeopathic remedies as they have the odd property of not having any of the active ingredient in final product. It makes me think that you need a bit more that just that, perhaps something that explicitly says that should the ingredient not be present in the product in any substantive amount, it should be indicated as â€˜noneâ€™ or whatever. As he correctly says, there is far too much ignorance and professional bias against homeopathic medicine, as demonstrated here, issuing from modern science, money-grabbing companies and tax-grabbing governments. The pseudo-scientific terminology and false premises brought against it are due to gross ignorance of its nature, egs, its ‘minimum dose’ â€˜dilutionâ€™ principles, which cannot be scientifically measured by their methods. These people prove nothing but their ignorance and bias. Homeopathy is easily and best scientifically proved by its â€˜effectsâ€™. For this there is plenty of proof. How do you establish the presence of invisible atoms or neutrons anyway? But by their consistent effects. Do you really (sincerely) want empirical scientific proof that homeopathy cures? â€˜Consistent results over a period of timeâ€™ are sure proof that it works and history does this for you. But this is not enough for the biased. There is plenty of evidence and proof in the writings and of the Materia Medicas written by its founders and practitioners alone, but doctors are too frightened, busy or biased to study this complicated knowledgeable science. Also, there are well known documented success stories such as those from exclusively homeopathic hospitals in both USA and UK, as compared with other hospitals, during epidemics, egs, Influenza and other disaster times. Also in India, where homeopathy was at that time a very popular medicine due to its success and economy. I cannot sit back and listen to all the theoretical dribble after some 25 years of practical personal experience with homeopathy. Not just my own experience, but as parent of eight with thirteen grandchildren, some who have their own families and use it regularly. After my own miraculous cure I studied and continued to use it and they too have done so. Yes, permanent cure following some ten years of acute suffering from chronic pneumonia and bronchitis, as many as three bouts every year that literally reduced me to a useless vegetable! The top thoracic specialist at Waikato hospital despaired over me, entirely gave me up , saying, ‘What do you expect of the medical profession Mr…”. I answered, “We are taught from childhood to put our faith in our doctors that they will ultimately find the answer…?” He could not reply, just wished me luck when I told him I had an appointment with a homeopath in Auckland (who happened at that time to be patron of the Homeopathic Society there and also an MD). This practitioner gave me a course of potentized Lycopodium that began my rapid recovery and the answer to my prayers. (I am now 74) and a longtime permanent cure from lung trouble after some ten years of intense suffering. â€œThe proof of the pudding is in the eatingâ€. True? Theories never end and prejudice is ever blind and destructive. While doctors feel they have not time, no inclination nor ability to study this difficult and complicated science they remain ignorant of the most harmless medication on earth, safer by far than herbalism, for one example. Please be honest with yourselves, how many millions have been killed annually throughout the world through willfully-blind or just plain ignorant doctors prescribing the deadly products of greedy, ruthless, pharmaceutical companies which frantically try to deny that there are any proven safe alternatives? On the other hand, for this present discussion, how many anti-homeopathy advocates can prove that people die or are injured by homeopathy – the safest of all medicines for even pregnant mothers and infants? Many doctors who speak against it know that they must prescribe homeopathy to a pregnant woman – not as a harmless placebo – but as a safe and effective treatment?! She or her child can accidentally eat an entire bottle of this medicine without any harmful effects but all other medications must be kept under lock and key with dire consequences from just a single pill! from some, especially pharmaceuticals, I wonder why? And these effects can be investigated using double-blinded, placebo-controlled trials, to ensure as much bias is removed as possible. And they have been. And homeopathy has no notable effects at all on health. Scientific research trials don’t test homeopathic (insane and implausible) methods, it’s precisely a measurement of whether homeopathy has any effect. What science says about homeopathy’s effects is that they’re non-existent. Our own individual observations are not reliable. Why do you favour your own highly biased, uncontrolled perceptions of homeopathy over more carefully checked and controlled experiments? Sometimes, for all our conviction, we are simply wrong. Homeopathy is easily and best scientifically proved by its â€˜effectsâ€™. For this there is plenty of proof. Homeopathic remedies have already been tested. The results showed that they have no more effect than placebos. (I pointed this out earlier.) Thatâ€™s not â€œtheoreticalâ€, etc. The answer to that one is pretty obvious, isn’t it? You can’t kill yourself from overdosing on small quantities of water. I guess the talc and sorbitol in the tablets might give you an upset tummy if you had enough. But they’re not dangerous for just the same reason as they’re not effective. There’s nothing in them either to help or do harm. Speaking for myself (others can speak for themselves), regards â€œanti-homeopathyâ€ note that my call was not for banning homeopathy. It is one option, but not one I listed. I suggested consistency across all remedies and aids to help customers determine accurately what a product contains and is able to do, or not do. The problem is that meaningless â€œwooâ€ remedies draw people away from taking sound treatments. Delaying proper treatment can make the condition worse and hence harder to treat. I have no more time for this but will quickly respond to both Grant Jacobs and Matty Smith. MS->But theyâ€™re not dangerous for just the same reason as theyâ€™re not effective. Thereâ€™s nothing in them either to help or do harm. Were it not for a series of experiments, confirmed in multiple labs and as yet unexplained, you might be able to say this. In high dilutions, although absent of molecules of the curative substance, it was shown in those experiments (Ennis, Inflammation Research, Vol 53, p181) and others easily found, that biological effects WERE STILL caused, for reasons unknown, AS THOUGH the missing molecules were still there. Nor is hers the only such type of experiment. Nor is the conception of the dose becoming MORE powerful as the dilution is increased all that impossible – for example there is a well known inversion of the dose response curve in certain areas of toxicology. The assertion, of the skeptic, pseudo-skeptic or scientism advocate, no matter how many appeals to authority (“science”, double blinded testing etc etc) remains mere opinion. The possibility of a homeopathic curative effect remains viable and needs to be investigated. Outside the narrow spectrum of inappropriate testing in artificial labs by artificial means, the evidence (not proof!!) is overwhelming that Homeopathy works. Only real science will tell us more. Grant Jacobs mantra repeated often, that …”Homeopathic remedies have already been tested. The results showed that they have no more effect than placebos.” is simply an opinion UNCONFIRMED BY ANY SORT OF REASONABLE SCIENCE and its sole basis is the subversion of Jacobs’ thinking by scientism, a fallacious movement exposed by, among others, chemist AND Homeopath Lionel Milgrom who exposed its logical positivist basis and its over-reliance on a single method of testing designed for pharmaceutical synthetics which cannot possibly have the same mechanism of action as Homeopathy. I’ll do a quick repeat myself that on the basis of its final grand total of eight studies, you can’t conclude a damn thing from the Shang study, nor from the others that found in favour of homeopathy. Going in circles, continually pretending that the mere opinion about homeopathy as placebo is established science, and ignoring the Ennis and other experiments (but mentioning BBC documentaries which are UNPUBLISHED in any scientific journal) which leave open the POSSIBILITY of an explanation of some sort of scientific mechanism, and attempting to trump current research and then END it, and ALL PRACTICE OF HOMEOPATHY with this sort of pretentious nonsense is, I submit, a danger not just to homeopathy but to ALL of established science and to freedom of medical choice. Oh yes, GJ, you asked for a link on the BBC “repetition” charade of Ennis’ experiment, the thing that alerted me that something was amiss in skepticism world and which caused me to re-investigate. There are several such links, one right at the New Zealand Homeopathic Society web site and the others I will leave as a simple exercise in googling. As you will read there and elsewhere, there was NO repetition and the producers and researchers eventually stated that such was never their intent, DESPITE what the announcer in the “documentary” said. I believe you said you had links to the contrary that the BBC thing was correct – if you want to, show the links. GJ also asked for the other labs successful repeat of Ennis’ experiment – it should be found easily in google, I don’t have time now; if you absolutely can’t find them, I’ll post later. Unfortunately you don’t seem to understand “real science” which probably explains your consistent repetition of your throughly debunked position. Notice how the word “dose” is part of the term “dose response curve”, though? This is a Gish gallop if ever there was one. We could spend days and days addressing the layers of misconceptions in your post, SkepticsBane. The most standout parts being the accusations of scientism, and logical positivism, and the continued confusion over the fact double-blinded, placebo-controlled testing is appropriate for finding results despite the methodology involved. I have no interest in ending homeopathy. I seems the kind of thing that can’t be beaten – an unsinkable rubber duck of nonsense – BUT I would like to see it regulated. Nobody who is actually sick should be given a placebo which will merely alleviate the symptoms, leaving them still untreated, sick, and at risk. I specifically wrote â€˜testingâ€™, not opinion. Controlled testing not â€œmere opinionâ€. Also, please don’t shout. (All caps = shouting.) Likewise trying to slur people by placing stances on what theyâ€™re written is a bit tasteless, as is accusing others of what youâ€™re doing yourself, as is being intentionally patronising – that sort of thing is best left for teenaged trolls. I don’t believe asked for these; perhaps youâ€™re confusing me with someone else. I[t] seems the kind of thing that canâ€™t be beaten â€“ an unsinkable rubber duck of nonsense â€“ BUT I would like to see it regulated. Nobody who is actually sick should be given a placebo which will merely alleviate the symptoms, leaving them still untreated, sick, and at risk. I suggest reading Jim’s article (aka ‘MacDoctor’), linked in the first sentence of my article, for more on the point that the second sentence makes. Regards the first sentence and my article, it seems to me that “banning” homeopathy wouldn’t (easily) achieve the end of peddling it and those that believe in it. The point in considering excluding them from pharmacies would be that people wouldn’t associate then these products with mainstream medical care, but with stores that are clearly not part of the medical establishment, and with that at least some people might exercise a little more thought over choosing to use the products. Irrespectively of where these products are sold, I do think the labelling needs to change. 1. How would you test homeopathy? 2. Since you think homeopathy only works with individualised consultations and perscriptions – should homeopathic remedies be sold over the counter? I would love to see a good post on Sciblogs about some of these incredibly misleading terms like “allopathic” sometimes. They’re parroted so uncritically and with no apparent regard for meaning. I see homeopathic drive-by shooter “Dr” Nancy Malik has shown up. Hilarious 🙂 Funnier that she probably realises in my eyes: this rewording of Complementary or Alternative Medicine only works by a nonsense phrasing doubling up the meanings. Present-day homeopaths consider â€˜conventionalâ€™ and â€˜allopathicâ€™ to mean basically the same thing so this is the same as nonsensically writing Conventional Conventional Medicine or Allopathic Allopathic Medicine. I believe, strictly-speaking, the term allopathic, as invented by the founder of homeopathy, refers to the convention medical practice prior of the early 1800s and earlier, i.e. prior to modern science-based medicine. Practices in those days included things like blood-letting, etc., that havenâ€™t been used for a long time, displaced by modern medical practices. Could do, but that the term is usually used by homeopaths to pejoratively frame those in mainstream medicine says most of what is needed to be said, in my opinion. The literal meaning refers to using treatments that differ from the cause of the disease; homeopathy claims to use “like with like”. It’s not useful to take this meaning in isolation, however, as itâ€™s invariably used dismissively as Nancy has. There are plenty of definitions of this and other similar “terms” on-line. WooHoo! The NancyBot did a drive-by post. Wow… 2 days. She’s usually faster than that. For those that don’t know the NancyBot it is a script (as far as we can tell) hosted by a homeopth that goes by the name of Dr Nancy Malik. I quote the name because after some digging others found out that to use her full title we should refer to her as just plain old Nancy Malik. As for the NancyBot reference just google the entire comment. We’re fairly certain it’s a script running somewhere. “Allopathic medicine” is a made up term coined by Samuel Hahnemann to describe conventional medicine. It never really caught on and most alt-med snake oil peddlers don’t realise that they’re the only ones that use it. I do like the use of “Conventional Allopathic Medicine” as a definition of CAM that the NancyBot keeps promoting too. I personally think that we should concede that point and start referring to alt-med by a more descriptive term. I mean there’s no such thing as actual alternative medicine right? It’s either medicine, or it’s not. So, borrowing a term from Mark Crislip I’d like to promote the use of “So Called Alternative Medicine” or SCAM. More accurate all around I think. I know the history of the term “allopathic”, I’m just finding that in my day-to-day dealings with homeopathy users and supporters – friends and family – they have seized upon these terms. There’s so much double speak going on, and it really does seem to ensnare people. Perhaps itâ€™s just that people feel grand when they’ve just learnt a new term they think makes them sound impressive or knowledgeable – ? While weâ€™re on the subject, the term is misplaced in another way. For modern medicine whether the treatment uses “like against like” (homeopathic) or not (allopathic) besides the point. * What matters is if the treatment works, and sound testing to back that. How ridiculous it seems some skeptics can become. For a start if one denies the homeopathic principle, i.e. ‘like cures like’ and calls, it a hoax or scam, they must reject the principle of antidotes and vaccinations also as a scam! But I doubt anyone considering themselves an intelligent thinker would do this? Kindly do think again for a moment. Why would I exert consideration and patience to offer you my personal testimony of my own healing when there are thousands of others also to confirm the effectiveness of homeopathy over the past 100 or so years? Have you ever studied it – just a little, or are you trying to rubbish something that as yet you know little or nothing about? However, homeopathy must be used knowledgeably to avoid ‘hit or miss’. It requires some instruction to prescribe and preferably, at least minimal practical experience to be administered effectively. This can be a major problem, especially buying from chemists, who in my experience do not or cannot, prescribe it even for the slightest ailment. As said in my last post, my recovery from my 10 year chest condition, repeat flu-bouts, pneumonia and bronchitis, began almost immediately after taking highly potentized Lycopodium prescribed by a homeopath (who happened to be also a practicing MD. I was then in my thirties and am now 74). I had acute bouts at least three times a year and spent the rest of the year recovering from the exhaustion of them. I give you this after reading your posts in my pity for your appalling ignorance concerning this wonderful medicine. It seems some may insanely call my recovery â€˜placebo or scamâ€™ or even â€˜chanceâ€™ or â€˜coincidenceâ€™! I donâ€™t expect all to accept everything told them but some can discern liars from true? Had I told you of my many experiences advising or treating my family by homeopathy, 8 children, wife, self, 13 grand children (some with their own children) and others also over the years, I fear for your present mind-set, the salvation of your capacity to accept genuine credibility? No! Homeopathy â€˜will not go awayâ€™ as someone has already said here before. For those who genuinely receive it, personal experience is entirely scientific. Bless. Also, strictly-speaking, itâ€™s not â€œthe homeopathic principleâ€ but one of several. (It is the literal meaning of the term â€˜homeopathicâ€™, however.) Other â€œprinciplesâ€ include disruption of â€vitalistic forcesâ€œ [a.k.a. msiams], that increasing dilutions of a substance will induce a larger curative effect [contradicting basic pharmacology], â€œsuccussionâ€ [basically, that shaking â€˜potentiatesâ€™ or â€˜activesâ€™ the remedy]. These other â€œprinciplesâ€ are not sound (to be polite). Homeopathy is interesting from a historical perspective. Conventional medicine of Hahnemannâ€™s day had some treatments that would now be considered pretty quirky (or wrong, dangerous, etc.) Homeopathy belongs in that same era, is equally quirky, and should really have died with the end of that era along with the other practices that have since been dropped. My impression is that the only reason it persists is the marketing efforts and mythology surrounding it. my personal testimony of my own healing when there are thousands of others also to confirm the effectiveness of homeopathy over the past 100 or so years? It has also been pointed out one of the reasons why anecdotes are limited. Anecdotal observations canâ€™t distinguish between different possible reasons for an event happening (recovery, in this case). Itâ€™s one reason why controlled trials are used. As a consequence, personal accounts cannot establish if something works – formal testing might. This is a partly contradictory statement obviously intended to divert from my challenge for any skeptic to deny the main principle of homeopathy? The ‘main principle’ it is, as both the meaning and chosen name of this science, a principle that is and has, long been very easily empirically established. It is also a metaphysical one in this sense, that God chose to uses it in His Bible, egs, the Cross; the atonement; the brazen serpent; etc, (i.e.’like cures like’ – the antidote principle). You did not give a denial of antidotes or vaccinations so I assume you accept them – the very homeopathic principle of this science you call unscientific and worthless! 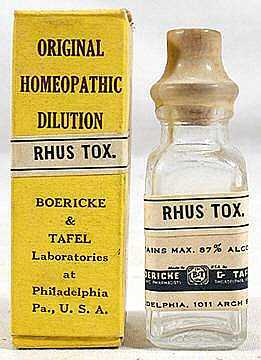 Skeptics of homeopathy like yourself through bias feel justified to ignorantly and insultingly call the devoted lifetime labours of its highly skilled founders, specialists and practitioners, who produced such mammoth works as their Materia Medica and other heavily researched writings, countless provings from medical cases and tests â€“ many in their own established hospitals – as a load of â€˜rubbish or hoaxâ€™! Naming all ‘non-controlled’ evidence as ‘unscientificâ€™ and therefore â€˜worthlessâ€™, is but a weak excuse for bias and prejudice. If you were yourself helped or cured from an otherwise hopeless condition as I was for one example, from your argument you would reject both cure and medicine as ‘unscientific, ‘fantasy’ or ‘ just good luck’! (LOL). The main principle that ‘like cures like’ is misguided, inaccurate and unfounded. Antidotes are not ‘like’. They are usually antebodies (usually extracted from another animal who have been given the venom). They are a taylored counter measure not a ‘like’ measure. Antigens are usually not ‘like’ the disease they prevent, they often ARE the disease they prevent. They are not given as a cure, but as a preparation for the disease. Neither of these example are ‘like cures like’. Bolt onto that everything else that wrong with homeopathy, i.e. the zero active ingredients, the failure in all the quality control trials etc and you are left with a medieval witch-doctor attaching fringe or pseudo-scientific words to a placebo. Quite untrue! Formal or controlled testing is not always necessary to â€˜establish things scientificallyâ€™. If the effects of the atoms of homeopathic dilutions, or other materials for example, cannot always be weighed and measured there are other scientific methods, such as â€˜the observation of consistent effects over a period of timeâ€™. This is part of the Scientific Method (i.e. â€˜observation of consistent cause and effectâ€™) which must be used because, although desired, controlled observations not always practical, possible, or even necessary. I’d agree with this. You also have to include the other aspects of the Scientific Method though. Double blind, randomised clinical trials are specifically designed to eliminate outside influences on the tests and the bias of the researchers. When homeopathy is put to the test using this method it performs no better than a placebo though. If you’re going to claim that DBRCTs don’t work with homeopathy then you are also arguing that homeopathy can’t work without outside influences and/or psychological input (bias) on the part of the patient or prescriber. If these are a required part of the process you can’t say that homeopathy (the solvents and pills) work on their own. Google is wonderful. Try checking out Weldon’s “The end of Fear” and a few of his other links. are to be preferred. Homoeopathy is not habit-forming, entirely safe, deep acting and has lasting beneficial effects. The same cannot be said of drugs commonly prescribed for emotional conditions. Thank you Weldon. But no thanks. I’ll pass on that one. If I develop agora or claustro phobia, I will trust the professionals rather than the single molecule in Aconitum 30c, ignore the bible and get on enjoying my short but fun life as best I can. I’ll be unfearfully dead a long time. Iâ€™d ask if you could try not characterise why others are writing what they do if you could. Regards the reasons I brought up the other notions homeopathy uses: I wrote mostly to clarify for others as anything else. When I write on some topics where people get â€˜stuckâ€™ on their views, I often try to address those who are â€œlurkingâ€ – reading but not commenting. Homeopathy has a whole raft of misguided notions and I believe understanding the wider picture helps. You did not give a denial of antidotes or vaccinations so I assume you accept them â€“ the very homeopathic principle of this science you call unscientific and worthless! Leaving aside that youâ€™re putting words in my mouth here, I’m the one that brought up that vaccination has an element of â€œlike-against-likeâ€, not you. (But note I wrote â€˜sort-ofâ€™.) I also explained what matters is not not if the treatment is â€œlike-against-likeâ€ or not per se. I suggest you go back and re-read. Naming all â€˜non-controlledâ€™ evidence as â€˜unscientificâ€™ and therefore â€˜worthlessâ€™, is but a weak excuse for bias and prejudice. It has nothing to do with a bias or prejudice. (A straw-man argument.) It has to do with the limitations of uncontrolled studies. It’s just what they are: theyâ€™re limited in what they can show. Uncontrolled studies cannot distinguish if the remedy tested is in fact the cause of patients getting better (or not, as the case may be). They can only show a (possible) correlation of treatment with recovery, leaving open that it may be a false correlation, one where the recovery is in fact due to something else. The point about controls is that they set up the tests so that you compare the results for the remedy against the same setup without the remedy, so that the contribution of the remedy or â€˜not the remedyâ€™ to the outcome can be found. In the case of testing homeopathy, youâ€™d run two sets of trials. One with the actual homeopathic remedy, one with a substitute that is (say) a sugar pill in itâ€™s place. Do this for sufficient numbers of patients so that the results are meaningful (statistically sound), making sure that the practitioner treating the patients doesnâ€™t know if they are offering a homeopathic pill, or a sugar substitute. Compare the results for the different pills. If the results are no different, you know the homeopathic pill has no more effect than a sugar pill. A point others have noted is that â€˜alternativeâ€™ remedies predominantly target conditions people recover from on their own, given time. This has to be factored in, too. If you were yourself helped or cured from an otherwise hopeless condition as I was for one example, from your argument you would reject both cure and medicine as â€˜unscientific, â€˜fantasyâ€™ or â€˜ just good luckâ€™! (LOL). Youâ€™re begging the question in writing â€œhelped or curedâ€. There you have assumed that the treatment did help or cure, when in fact it may not have had any effect or contribution. As I was explaining, controlled studies are needed – to rule out that something other than the (proposed) treatment has a role in resolving the illness, that the treatment may in fact have little to do with the resolution of the illness, etc. As for what Iâ€™d do: Iâ€™d note that what actually resolved the illness couldnâ€™t be determined from a single incidence. Thatâ€™s life. I donâ€™t feel the need to invent a justification. Iâ€™m thinking that I should have re-worked that last one into a blog post. Never mind. WP->Quite untrue! Formal or controlled testing is not always necessary to â€˜establish things scientificallyâ€™. WP->If the effects of the atoms of homeopathic dilutions, or other materials for example, cannot always be weighed and measured there are other scientific methods, such as â€˜the observation of consistent effects over a period of timeâ€™. YES! Exactly. And the observation of consistent effects in Homeopathy is indicative, upon review of their literature, that some sort of curative effect IS happening. These observations are part of the scientific process and possess scientific significance even though they cannot be construed as proof. WP->This is part of the Scientific Method (i.e. â€˜observation of consistent cause and effectâ€™) which must be used because, although desired, controlled observations not always practical, possible, or even necessary. Gold-> Iâ€™d agree with this. You also have to include the other aspects of the Scientific Method though. Double blind, randomised clinical trials are specifically designed to eliminate outside influences on the tests and the bias of the researchers. Whoops. Sticky wicket. What the double blinded, randomised tests are designed for is not always what they accomplish. The testing environment is artificial and outside the normal patient doctor relationship. The statistics of the process fail, often. Gold->When homeopathy is put to the test using this method it performs no better than a placebo though. Incorrect. Is everyone going to keep parroting this nonsense?? Lord knows there is enough things to criticize in homeopathy without resorting to nonsensical diversions such as the old “it’s all placebo” nonsense. I’m certain it is in some cases. But…read the literature, look at some of the cures in the acute cases…. my God man, they could NOT POSSIBLY be placebo. Look at the comments of the doctors who administered the remedies, according to Homeopathic principles. Look at the chronic cases in which every attempt failed to cure or improve the patient until the administration of the homeopathic method. Post hoc ergo propter hoc? Sure, sometimes. But ALL the time, or “coincidence” that the amelioration just happened then, or “placebo” to explain away ALL instances? Come on dudes, you strain the credulity of any rational person with this nonsense. Gold->If youâ€™re going to claim that DBRCTs donâ€™t work with homeopathy then you are also arguing that homeopathy canâ€™t work without outside influences and/or psychological input (bias) on the part of the patient or prescriber. NONSENSE. They don’t work with Homeopathy because, particularly in the light of the high dilutions, there is no chance of a biochemical mechanism operative in Homeopathy akin to conventional pharmaceuticals. Try using a ruler to weigh a potato. Inapplicable. Amazingly, some of the Homeopathic double blinded tests succeed anyway, just barely but enough to raise an eyebrow. NONE should have. And no it is not statistical anomaly. You don’t dare base that ‘Homeopathy is no better nonsense’ on that ridiculous Shang meta-analysis do you – such a sweeping conclusion from EIGHT trials ?? Crack open some Homeopathy books and archives, admit there is some sort of powerful curative effect, and let real scientists tell us how. Then we’ll start getting somewhere. Not someone telling us their opinion of how not. No. If you’re making a claim it’s up to you to prove it, not anybody else. And homeopathy is an extra-ordinary claim as it requires so much of what we know about chemistry and physics to be wrong, so it requires extra-ordinary evidence. I’m happy to read whatever you think is convincing, point me to the studies. I’m not interested in anecdotes or comments, but if you’ve got the proof that there’s even a mechanism by which homeopathy could work, then let’s have it. SB -> You donâ€™t dare base that â€˜Homeopathy is no better nonsenseâ€™ on that ridiculous Shang meta-analysis do you â€“ such a sweeping conclusion from EIGHT trials ?? You’re right. I don’t base it on the Shang meta-analysis. I base it on the Scientific Method, which you clearly show you have little understanding of. I’ll add these to the pile of evidence too. The references are fairly comprehensive. The first one, especially, spent a hell of a long time looking at the submissions from actual scientists _and_ the homeopathic industry. If you want good analysis of the available data EC#2 is likely the best and most comprehensive you’ll find. Nuts. The “first one” is actually the second one in the post above. Super simple question: How would you test homeopathy? The tests examined there are not â€˜opinionâ€™. Summarising, homeopathic remedies have shown not to have â€˜consistent effectsâ€™ above that of placebos. The mechanisms of action proposed are, to be polite, implausible. Iâ€™ve explained briefly why formal testing is needed. Certainly for some things in other fields this type of formal testing is not easily done, or cannot be done at all, but those studies are acknowledged to be weaker for it. NONE should have. And no it is not statistical anomaly. Actually, you expect some to, especially if smaller trials are involved. Itâ€™s statistical variation at play. The popular phrase â€˜a statistical anomalyâ€™ is a bit out of context here – this sort of variation is the normal expected thing. [â€¦] let real scientists tell us how. Then weâ€™ll start getting somewhere. Not someone telling us their opinion of how not. Youâ€™re giving opinions (anecdotal accounts, etc. ); Iâ€™ve been pointing to science. If homeopathy works, then where are the homeopathic treatments for septicemia, heart attacks and acute asthma attacks? I saw a nice poster the other day with verbiage and a large toilet in the background: “If water has memory, then homeopathy is full of s**t”. Followers also don’t explain why the water moelcules don’t remember the bucket, the stirring implement, the bottle, the cork….. or tongues theeth and mouths when its taken…never mind all the crap its been in touch with previously. refuse to buy it after its been through the laser scanner, and sometimes wave crystals over the top of it to make sure it behaves OK. These are all classic signs of superstitious behaviour, which occurs when there is no correlation between suposed cause and effect, much as observed by Skinner with his pigeons (google B F Skinner). [â€¦], and sometimes wave crystals over the top of it to make sure it behaves OK.
Oh dear. Sounds like something out of this Mitchell and Webb sketch (Homeopathic A&E). I think you will find many of the people on this site have studied homeopathy quite closely which is why we are firmly convinced it does not and cannot work. For the past year every time some supporter of homeopathy has claimed “here is a paper which supports homeopathy” I have tracked down the paper, only to findit has been misinterpreted or the research has been performed poorly, or that the paper only shows the placebo effect. Each time I give homeopathy supporters the benefit of the doubt and each time I am disappointed. Furthermore,in most cases, it appears the advocate have done little else but regurgitate the claims of someone else that the paper “supports” homeopathy or have themselves selectively read the abstract of a paper to find the interpretation of what they want. And then they have the gall to call skeptics ignorant when many of us go to the effort of tracking down and reading the actual papers. Hundreds of studies of homeopathy have been carried out on all different sorts of homeopathic remedies.The majority have shown no effective beyond placebo. Occasionally one indicates possibly an affect beyond placebo,but statistically this is bound to occur, particularly with small sample sizes. You talk about homeopathy having healed you of disease. Perhaps you should give your own body more credit for eventually dealing with your illness instead of attributing it to “magic” water. ScepticsBane Responds! to Gold, David, Grant, Papango, Edmonds et al. Gentlemen, in each and every claim that you make against the efficacy of Homeopathy, I see you consistently hide behind official reports, studies and scientific analysis COMPLETELY DEPENDENT on a single mode of testing which, I am compelled to reiterate yet again, in my humble opinion is COMPLETELY INADEQUATE, insufficient, and inapplicable in the testing of Homeopathy. It gets worse. The over reliance on a SINGLE METHOD OF TESTING, to make the kind of determinative conclusions attempted against Homeopathy is, in fact, a manifestation of an incorrect mode of thinking, in fact ultimately fallacious, called SCIENTISM. This fallacy attempts to TERMINATE ALL DEBATE, SILENCE ALL OPPOSITION, and ultimately wrest control of freedom of medical choice from the individual (though some may disagree with that last point, and state most vociferously to the contrary, the end result of scientism is control). The “scientism” fallacy makes broad and continued protestations of loyalty to “science” exactly as every critic has done here and then DEMANDS that all opposition restrict their responses to the narrow focus of what may very well be (and IS in my opinion) and incorrect, and/or insufficient method of testing. The full details of the testing issues and the other related issues are in the “Beware Scientism’s Onward March” by Lionel Milgrom, as I indicated before. I suggest most of the “skeptics” who have not read it, do so (I know some already have). Why? BECAUSE THE FULL EXTENT OF MILGROM’S CRITICISMS AND IDEAS REMAIN UNMENTIONED in this blog and in many others as the discussion is returned, again and again, to the single wrong method of testing and the elevation of that as the be-all and end-all of the debate. I can assure you, it is NOT. On the question asked by some, what method of testing would I use. The answer is quite simple. I’m neither a researcher, nor a scientist and THAT is a question for them. I ask the same question too but I do know that Milgrom is spot on regarding his criticisms of the method of testing, and its virtual elevation, by the sceptics, as almost the sole means by which to silence all debate, the other being the personal opinion and pseudo-scientific feelings about the impossibility of the “memory” of water. Edmonds->If homeopathy works, then where are the homeopathic treatments for septicemia, heart attacks and acute asthma attacks? If you bother to read the homeopathic literature, you obviously haven’t, you will find many interesting, often quite dramatic recoveries from all of the illnesses you mentioned and many more. The question is, are those cures or recoveries from such acute illnesses the genuine result of the Homeopathic intervention? In some cases they are NOT. But my argument is that the totality of such extreme cases must overwhelmingly support that they ARE. Science must decide, and those situations are beyond the scope of the controlled test. NOW WHAT? On the contrary, I have read homeopathic literature. I’ve just done a search of the journal “Homeopathy” and can find no articles which show that homeopathy is effective in the treatment of acute asthma, heart attacks or septicemia. If you do have such references, perhaps you should share them with us? How dramatic. If debate was being terminated then why hasn’t Grant just blocked your posts? It is fairly obvious that debate hasn’t been terminated as we are debating it with you. The problem for you is that we are asking for facts and refusing to accept your emotive appeals that homeopathy “really” works when 200 years of homeopathy has shown that, beyond the placebo effect, it is no more effective than a glass of water, which is not surprising seeing that is all it is. If you truly want to debate that homeopathy does work perhaps you could provide some EVIDENCE rather than using anecdotes and making claims about “scientism”. ScepticsBane, Weldon Pellew, do you think this type of product is appropriate for treating children? SkepticsBane, I’m putting this at the top as I’m not convinced you bother reading all the way to the end of our posts. Your constant reiteration of points that we’ve addressed and you’ve not countered certainly suggests as much. You’re not a very effective debater. If you were you would be winning some points occasionally and altering your position to better be able to argue yours. * You fail to address points with facts to back your position. * You constantly fail to grok the points you’re debating against. * You dismiss sound evidence because you don’t like the findings. * You recommend blatantly biased sources to back your points. * You are inconsistent within your own points of argument often countering your own position within the span of one post/reply cycle. When you get down to it you’re just not very well equipped to argue for your side of this “debate”. I would recommend studying debating technique but I doubt you have the ability to take on constructive criticism. We’re not hiding behind anything. This is the _research_ and the findings of that research. That you don’t like it is irrelevant. You claim to be more skeptical than most. A true skeptic would accept the findings of the research regardless of their own personal bias. They may hold off on changing their position but as more and more evidence (the results of studies) piles up on one side of a topic they should alter their position to back the consensus. SB -> COMPLETELY DEPENDENT on a single mode of testing which, I am compelled to reiterate yet again, in my humble opinion is COMPLETELY INADEQUATE, insufficient, and inapplicable in the testing of Homeopathy. You are working on the presumption that your opinion trumps the best testing methods that have evolved out of generations and generations of researchers and scientists working out how to test things in such a way as to best eliminate their own biases and protocol error? You ser, are the embodiment of arrogance. SB -> It gets worse. The over reliance on a SINGLE METHOD OF TESTING, to make the kind of determinative conclusions attempted against Homeopathy is, in fact, a manifestation of an incorrect mode of thinking, in fact ultimately fallacious, called SCIENTISM. It’s not a single method. It’s a methodology. One of it’s purposes is to prevent us from deceiving ourselves. You appear to prefer the self deception approach. That’s just a little be sad. SB -> On the question asked by some, what method of testing would I use. The answer is quite simple. Iâ€™m neither a researcher, nor a scientist and THAT is a question for them. And yet you actively reject the method of testing that the vast consensus has decided as the best one to date. Donâ€™t shout please. (I asked if you would not to do this some time ago.) Use italics if you want to emphasise, or bracket the phrase in asterisk. You might want to think about why an ad hominem and/or straw man argument would prove anything either way – youâ€™re best to try playing the ball not the players. Thank you for admitting you lack the skills and knowledge to judge this – but that means you canâ€™t judge it either way. If you lack the skills and knowledge to know what is a correct way to test it, you also lack the skills and knowledge to know if Milgrom is right. You could try learn why DBRCT (double-blind random control trials) are used. Theyâ€™re done for good reasons. Youâ€™re repeating yourself. The evidence for saying water canâ€™t have a memory is a consequence of established science, not â€œopinionâ€ or â€œpseudo-scientific feelingsâ€. But my argument is that the totality of such extreme cases must overwhelmingly support that they ARE. Science must decide, and those situations are beyond the scope of the controlled test. Itâ€™s your argument as you say – therefore itâ€™s yourâ€™s to justify with evidence. Strictly speaking â€˜the burden of proofâ€™ says you donâ€™t get to pass it off to someone else if itâ€™s your claim, but let’s let that slide. These treatments are not â€œbeyond the scope of the controlled testâ€. As a thought: You repeated refer to cases you believe supports your position. Following my point about sound evidence, how you know if these claims are genuine examples where the person has recovered because of the homeopathic treatment? From a single or small number of cases, there is no way for anyoneâ€”scientist, you, anyoneâ€”to know as there are too many other possibilities that would need to be ruled out first. Edmonds->On the contrary, I have read homeopathic literature. Iâ€™ve just done a search of the journal â€œHomeopathyâ€ and can find no articles which show that homeopathy is effective in the treatment of acute asthma, heart attacks or septicemia. If you do have such references, perhaps you should share them with us? Searched one journal? Looking for what, the inappropriate type of tests? There are 200 years worth of journals. Looking for “proof” of “efficacy”. How can it be “proved”, it is an emergency situation? by a high dilution homeopathic remedy. Now what? Will Grant tell us it was post hoc ergo propter hoc? Read about the speed of the recovery. Will someone tell us it was not septicemia? OK. What if there were many of these cases (there are, go search, search for extreme acute cases – strokes, heart trouble etc. etc.). Could some of the reporters have misstated the facts? Maybe SOME have But Now what? This is NO proof but is it not evidence easily strong enough to undertake research on the possibility of efficacy of homeopathic intervention? If it is and was, then it is way past placebo. If not, then the homeopathy is not real. There is no answer yet and there cannot be double blinded tests for such conditions unless you want to bring back Dr. Mengele. Note that I do NOT condone such a speculative treatment for anyone unless no chance of conventional medicine is available. All I want to know is, did the homeopathic remedy play a role in the apparent therapeutic? These are the kinds of questions that require analysis, invention of new testing methods and new testing devices. They will not require more double blinded testing, the partially failed method applicable to pharmaceutical synthetics. It will do no good to look more cases and yet more and present them to you without the scientists giving us professional opinions about the framework in which to interpret them and the theories to explain them. It will do NO good at all to claim that it is all meaningless placebo in the face of mounting evidence to the contrary. That only suppresses the research, does it not? You are right, Gold, I’m not a debater, just stating my opinion and that opinion is more negative of the arguments against homeopathy than positive of the arguments for it. The “evidence” is all around you. You can choose to ignore it or to acknowledge it and then seek out answers. Note to Grant, the caps are for emphasis, not shouting. Given youâ€™ve already admitted you donâ€™t know enough to suggests tests, then your now writing how they ought to be done is nonsensical. You canâ€™t have that both ways. You are right, Gold, Iâ€™m not a debater, just stating my opinion and that opinion is more negative of the arguments against homeopathy than positive of the arguments for it. As has been repeatedly pointed out to you, formal tests are not opinion. If you want your opinion to have substance make some effort to read the testing that has been done. Note to you: I moderate this blog – donâ€™t push your luck. I told you how to emphasise so itâ€™s not shouting. Youâ€™d do well to take good advice when itâ€™s given. The “one journal” I mentioned is the most scientific of all homeopathic literature that I have come across and has been around for a number of years. The fact that it could not show that homeopathy is effective in the treatment of chronic diseases speaks volumes. Thank you for the “reference” you supplied – a blog written by a homeopath. Hardly an unbiased account. Quite frankly I couldn’t have found a better example of how stupid and dangerous homeopathy is. The homeopath describes mucking around trying to find a homeopathic remedy that would work all the time while the patient became sicker and sicker. It is sheer luck the patient did not die, and unfortunate he had to go through needless discomfort when a decent antibiotic could have sorted the infection out. Thankfully it looks like the young mans immune system finally kicked in. I would ask everyone else reading this blog to read scepticsbanes link and decide for themselves whether homeopathy is a sensible approach. And if you do indeed have a reputable reference showing that homeopathy works then please share it with us. Providing blogs which appear to demonstrate the blindness of homeopathy may be interesting but they do not support your cause. I read that link (while you were writing, I think) & was horrified – how the heck could she let that kid get sicker & sicker like that? Why was 999 the last resort rather than the first? A question – if she’s so convinced that highly diluted extract-of-rotten-meat (fortunately diluted to the point that there’s none left!) is a curative for septicaemia, then why hasn’t she gone on to publish about this in the arena that would make a difference: medical journals, not a personal blog? Modern medical science would be delighted to hear of a new successful treatment for bacterial sepsis like this. I was on the Bluebridge Ferry last night, and given the 90km/h Southerly I thought I’d get some anti-seasickness pills while we were still in the Sounds. But you know what? They *only sell homeopathic “remedies” onboard*. I asked the guy behind the counter if they had any actual medicines for seasickness, and he just told me, “you need to take those an hour before the sailing for them to work”. Uh-huh. Iâ€™ve finally found time to have a quick skim of the article SB refers to. This is the sort of thing that I had in mind when I wrote Medical DIY…. She should have taken the nurseâ€™s advice. The â€œexperienced colleagueâ€ is equally guilty. Yet she (they) preferred to be a DIY â€œexpertâ€. Note how she presumes the treatment cured her son, when she has no basis for forming that conclusion – one of the points I have been trying to make. For example, she doesnâ€™t consider if the illness passed because her son successfully fought it off on his own and has no way of distinguishing the two, yet decides to self-justify her actions. As others have said, itâ€™s a fine example of why homeopathy is (can be) such bad news. HELP!!!!! That’s a SCREAM Grant. RE: end of the world. Heard about these guys a few months back, that clip just makes me angry that these people’s lives have been so disrupted by a fantasy. But, you know, what’s the harm? Should that be sadly diluted? To homeopathic dilutions – i.e. with not a scrap of sense left. Must check that out. Brian Cox is usually good value. Sorry your comment took so long to approve – for some reason it didn’t show up sooner. (It appeared delayed in the comments feed.) You should be able to comment without being moderated from now on. Way off topic: I know a deaf woman whose poor balance has a benefit – she doesnâ€™t get seasick. Grant – thought you might enjoy this. It’s from Peter Bowditch’s very enjoyable sceptic website ratbags.com. Apologies in advance for my lack of formatting skills. Some may think that all you have to do to become a homeopath is get a copy of Materia Medica and practice diluting and succussing. There is in fact a comprehensive training program. Remove the brain. It does not have to come out in one piece, so any method may be used which does not damage the skull too much. Blend the brain with 10 times its weight in sand. Take 10% of the mixture and blend that with 10 times its weight in sand. Repeat step 3 20 times. Pour the final mixture back into the cavity where the brain was. If the brain was removed by trepanning or arthroscopy, seal the hole in the skull with a cork (do not use a rubber bung). If the entire top of the skull was removed, put the top back on carefully and apply an electric current vertically until the bone knits again. Succuss the head twice on each side with a brick. It should be noted that some less reputable training institutions have been offering accelerated courses which leave out the first 6 steps. To ensure that your homeopath has been properly trained, look for the horizontal scar running around the head just above the eyes, or ask to see the cork.